Home Profile Directory Trung Duong Ph.D.
Ph.D. Mechanical and Aerospace Engineering, Oklahoma State University, Stillwater, Oklahoma, 2013. M.S. Mechanical and Aerospace Engineering, Oklahoma State University, Stillwater, Oklahoma, 2009. B.S.E. Mechatronics, Hanoi University of Technology, Hanoi, Vietnam, 2004. 2018 – present, Assistant Professor, Department of Engineering, Colorado State University-Pueblo, Pueblo, Colorado. 2017 – 2018, CBASE Research Professor, Department of Engineering, Colorado State University-Pueblo, Pueblo, Colorado. 2014 – 2017, Postdoctoral and then Research Faculty, Center for Advanced Infrastructure and Transportation (CAIT), Rutgers the State University of New Jersey, New Brunswick, New Jersey. 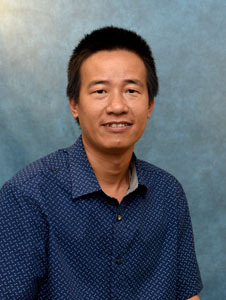 2004 – 2014, Lecturer and then Senior Lecturer (tenured), Department of Mechanical Engineering, University of Transport and Communications, Hanoi, Vietnam. 2012 – 2013, Engineer – Intern, New Product Development Center, Stillwater, Oklahoma. 2007 – 2013, Graduate Research Assistance and then Senior Research Assistance, Mechanical and Aerospace Engineering Department, Oklahoma State University, Stillwater, Oklahoma. 2012 – 2013, Teaching Assistance, Mechanical and Aerospace Engineering Department, Oklahoma State University, Stillwater, Oklahoma. Summer 2008, Research Assistant – Intern, Department of Biology and Agriculture Engineering, Oklahoma State University, Stillwater, Oklahoma. K. Dinh, N. Gucunski, J. Kim, and T. H. Duong, “Method for attenuation assessment of GPR data from concrete bridge decks,” NDT and E International, vol. 92, 2017. N. Gucunski et al., “RABIT: implementation, performance validation and integration with other robotic platforms for improved management of bridge decks,” International Journal of Intelligent Robotics and Applications, pp. 1–16, 2017. N. Gucunski, B. Basily, A. Maher, J. Kim, and T. H. Duong, “Use of Robotics in Automated and Comprehensive NDE of RC Structures,” in Proceedings of the 1st International Conference on Construction Materials for Sustainable Future (CoMS), 2017, pp. 49–55. N. Gucunski, J. Kim, K. Dinh, T. Duong, and R. Zobel, “Similarities and Differences in Condition Assessment of Concrete Bridge Decks by Visual Inspection and NDE,” in NDE/NDT for Highways & Bridges: SMT 2016, 2016, pp. 58–64. J. Kim, N. Gucunski, K. Dinh, and T. H. Duong, “Advanced Integration and 3-D Visualization of Data from Multiple Nondestructive Evaluation Technologies,” in Geotechnical & Structural Engineering Congress, 2016. K. Dinh, N. Gucunski, J. Kim, and T. Duong, “Understanding Depth-Amplitude Effects in Assessment of GPR Data from Concrete Bridge Deck Surveys,” in Transportation Research Board (TRB) Annual Meeting 2016, 2016. J. Kim, N. Gucunski, T. Duong, and K. Dinh, “Three-Dimensional Visualization and Presentation of Bridge Deck Condition Based on Multiple NDE Data,” Journal of Infrastructure Systems, vol. 23, no. 3, 2016. T. H. Duong and L. L. Hoberock, “On Selecting the Best Unsupervised Evaluation Techniques for Image Segmentation,” in Proceedings of the International Conference on Image Processing, Computer Vision, and Pattern Recognition (IPCV), 2016, p. 193. N. Gucunski et al., “Rapid and Comprehensive Characterization of Deterioration in Concrete Bridge Decks Using a Fully Autonomous Robotic NDE Platform RABIT,” in 19th World Conference on Non-Destructive Testing 2016, 2016. J. Kim, N. Gucunski, B. Basily, T. H. Duong, and K. Dinh, “Bridge Deck Deterioration Detection Using a Fully Autonomous NDE Robotic Assisted Bridge Inspection Tool, RABIT,” in Civil, Environmental, Architecture Symposium (CEA), US-Korea Conference (UKC), 2016. N. Gucunski et al., “Assessing Condition of Concrete Bridge Decks by Robotic Platform RABIT for Development of Deterioration and Predictive models,” in 8th International Conference on Bridge Maintenance, Safety and Management (IABMAS), 2016. K. Dinh, N. Gucunski, J. Kim, and T. H. Duong, “Understanding depth-amplitude effects in the assessment of GPR data from concrete bridge decks,” NDT and E International, vol. 83, no. June, pp. 48–58, 2016. J. Kim, N. Gucunski, T. Duong, and K. Dinh, “Presentation of Bridge Deck Condition Using Three-Dimensional Visualization of Multiple NDE Data,” in 17th Annual New Jersey Department of Transportation (NJDOT) Research Showcase, 2015, p. 1. L. V. Nguyen, H. M. La, and T. H. Duong, “Dynamic Human Gait Phase Detection Algorithm,” in Proceedings - ISSAT International Conference on Modeling of Complex Systems and Environments 2015, 2015. N. Gucunski et al., “Concrete bridge deck early problem detection and mitigation using robotics,” in Structural Health Monitoring and Inspection of Advanced Materials, Aerospace, and Civil Infrastructure, 2015, vol. 9437, no. May, p. 94370P. J. Kim, N. Gucunski, T. H. Duong, and K. Dinh, “Bridge Deck Condition Presentation Using 3D Visualization of Multiple Nondestructive Evaluation Data,” in International Symposium Non-Destructive Testing in Civil Engineering (NDT-CE), 2015, vol. 20, no. 11. N. Gucunski et al., “Concrete Bridge Deck Deterioration Detection and Characterization Using a Fully Autonomous Robotic Platform RABIT,” in International Symposium Non-Destructive Testing in Civil Engineering (NDT-CE), 2015, vol. 20, no. 11. K. Dinh, N. Gucunski, J. Kim, and T. H. Duong, “Improved GPR-based Condition Assessment of Reinforced Concrete Bridge Decks Using Artificial Neural Network,” CrS Non-Destructive Testing Journal, vol. 5, no. 2, pp. 3–13, 2015. K. Dinh, N. Gucunski, J. Kim, T. H. Duong, and H. M. La, “Attenuation-based methodology for condition assessment of concrete bridge decks using GPR,” in 32nd International Symposium on Automation and Robotics in Construction and Mining (ISARC), 2015. T. H. Duong, M. Emami, and L. L. Hoberock, “Automatic dishware inspection: Applications and comparisons of two new methods,” in Proceedings - 10th International Conference on Machine Learning and Applications, ICMLA 2011, 2011, vol. 1. T. H. Duong and L. L. Hoberock, “Automatic clustering using a Mahalanobis ART neural network and density-based removal pre-processing,” in Proceedings of the 2011 International Conference on Image Processing, Computer Vision, and Pattern Recognition, IPCV 2011, 2011, vol. 2. T. H. Duong and L. L. Hoberock, “An Euclidean ART Neural Network for Automatic Heuristic Clustering,” in The 30th Oklahoma AIAA/ASME Symposium, 2010. T. H. Duong and L. L. Hoberock, “New methods for dishware identification and inspection,” in ICINCO 2009 - 6th International Conference on Informatics in Control, Automation and Robotics, Proceedings, 2009, vol. 2 RA, pp. 127–134. J. Kim, T. Duong, K. Dinh, N. Gucunski, and H. Azari, “Nondestructive evaluation of four sister bridges in Virginia using manual NDE technologies and robotic platform RABIT,” Project No. CAIT-UTC-059, Grant No. DTRT12-G-UTC16, July 2015. K. Jinyoung, N. Gucunski, K. Dinh, and T. H. Duong, "Nondestructive Evaluation Scanning of Concrete Bridge Decks for Deck Deterioration Modeling,"Final Report, New Jersey Department of Transportation, 2015. J. Kim, N. Gucunski, T. Duong, and K. Dinh, “Presentation of Bridge Deck Condition Using Three-Dimensional Visualization of Multiple NDE Data,” The 17th Annual New Jersey Department of Transportation (NJDOT) Research Showcase. Mt. Laurel, New Jersey, Oct 28, 2015. The Transportation Research Board (TRB) 95th Annual Meeting. Fully Autonomous Robotic Platform- RABITÔ Exhibition. Washington DC, January 8–12, 2016. Council of University Transportation Centers (CUTC) Summer Meeting. Fully Autonomous Robotic Platform- RABITÔ demo. New Brunswick, New Jersey, June 3, 2015. The Transportation Research Board (TRB) 94th Annual Meeting. Fully Autonomous Robotic Platform- RABITÔ Exhibition. Washington DC, January 8–12, 2015. "Bridge Deck Condition Survey Using Robotic Assisted Bridge Inspection Tool (RABIT)." 17th Annual New Jersey Department of Transportation Research Showcase, Mount Laurel, NJ, 2015. "Presentation of Bridge Deck Condition Using Three-Dimensional Visualization of Multiple NDE Data." 17th Annual New Jersey Department of Transportation Research Showcase, Mount Laurel, NJ, 2015. "Bridge Resource Program 2015, Non-Destructive Evaluation (NDE)" Bridge Engineering and Infrastructure Management, New Jersey Department of Transportation, Trenton, NJ, 2015. "Non-Destructive Evaluation (NDE) of Union Hill Road over Route 9 Bridge." Bridge Engineering and Infrastructure Management, New Jersey Department of Transportation, Trenton, NJ, 2014. The 16th Annual New Jersey Department of Transportation (NJDOT) Research Showcase. Mercer, New Jersey, Oct 23, 2014. Rutgers Day Showcase. New Brunswick, New Jersey, April 30, 2015. Rutgers Day Showcase. New Brunswick, New Jersey, April 30, 2016.
International Conference on Machine Learning and Applications (ICMLA-IEEE), Hawaii, USA, Dec 2011.
International Conference on Image Processing, Computer Vision, and Pattern Recognition. (IPCV), Las Vegas, NV, USA, July 18-21, 2011. IEEE Conference on Computer Vision and Pattern Recognition (CVPR -IEEE), Colorado, USA, June, 2011. The 30th Oklahoma AIAA/ASME Symposium, Tulsa, Oklahoma, USA, May 2010. Associate Editor of Journal of Information Processing Systems (JIPS), 2016 – present. Program Committee of International Conference on Machine Learning and Applications (ICMLA-IEEE). Las Vegas, USA, Dec 2016 – present. Program Committee of International Conference on Image Processing, Computer Vision, and Pattern Recognition. (IPCV). Las Vegas, USA, Aug, 2016. Program Committee of the ISSAT International Conference on Modeling of Complex Systems and Environments (MCSE), Da Nang, Vietnam, June 8-10, 2015. Program Member of the Conference on Theoretical and Applied Computer Science (TACS), Stillwater city, Oklahoma, USA, 2010. Program Member of the 30th Oklahoma AIAA/ASME Symposium, Tulsa, Oklahoma, USA, May 2010. Reviewer for IEEE Transactions on Mechatronics, 2014 – present. Reviewer for IEEE Transactions on Control of Network Systems, 2015 – present. Reviewer for Actuators Journal, 2015-present. Reviewer for Journal of Imaging, 2016-present. Reviewer for Journal of Journal of Information Processing Systems, 2016-present. Reviewer for Advanced Robotics, 2015-present. Reviewer for Applied Sciences, 2017-present. Reviewer for Journal of Robotics and Autonomous Systems, 2015 – present. Reviewer for International Conference on Machine Learning and Applications (ICMLA-IEEE), 2016-present. Reviewer for ISSAT International Conference on Modeling of Complex Systems and Environments (MCSE), 2015 – present. Reviewer for Proceedings of the ACM Symposium on Applied Computing – SAC, 2014. Best Poster Award at the 17th Annual New Jersey Department of Transportation (NJDOT) Research Showcase. Mt. Laurel, New Jersey, Oct 28, 2015. Full 5-year Doctoral scholarship from Oklahoma State University, September 2009 to May 2013. Full 2-year scholarship for a Master program in the US from Vietnamese Minister of Education, August 2007 to May 2009. Full 5-year scholarship from Center for Talents Training, Honors College, Hanoi University of Technology, Vietnam, August 1999 to May 2004. National Physics Olympiad, 3rd prize, Vietnam, May 2000. Silver Medal at National Contest of Physics for excellent high school students, Vietnam, April 1999. Bronze Medal at National Contest of Physics for excellent middle school pupils, Vietnam, April 1996.